More than a year-and-a-half after the release of Blaze, Fitbit is back with its first “true” smartwatch: Ionic. Ionic is Fitbit’s best fitness tracker to date — but the question on most people’s minds is whether it’s a good smartwatch. Let’s find out. For a smartwatch that’s named after an ancient architectural order that’s associated with clean and unadorned elegance, Ionic is far from the best looking smartwatch to come out in 2017. Fitbit says Ionic was designed completely in-house, which is a first for the company. The result, however, is a smartwatch that still looks more like a fitness tracker than an elegant timepiece. The watch is by no means an ugly device, but then it’s easy to pick out certain faults. For instance, the bezels around the display are substantial. Moreover, the design doesn’t coalesce into something that is greater than the sum of its parts. However, what Ionic lacks in good looks, it makes up for in functionality. 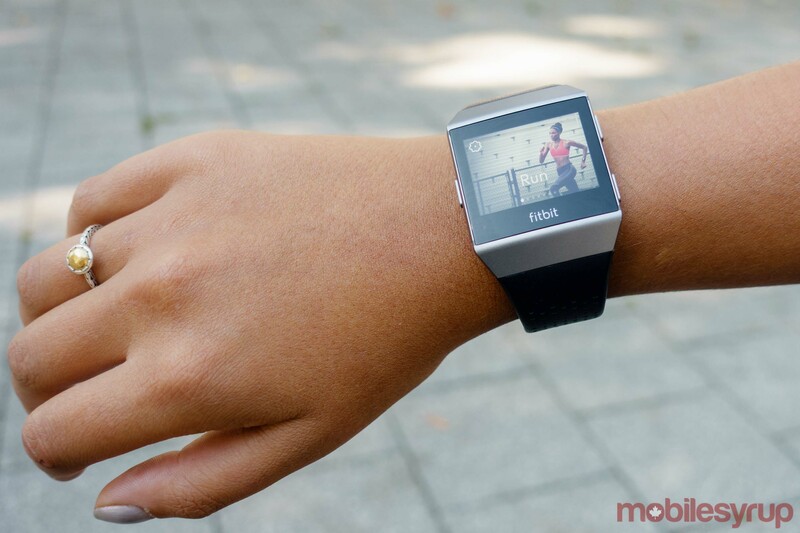 Ionic is Fitbit’s most capable device to date. One easy-to-spot highlight is Ionic’s heart-rate tracking. Ionic’s PurePulse heart-rate sensor is flush with the bottom of Ionic’s casing. With previous Fitbit trackers, such as the Charge 2, the heart-rate sensor juts out slightly from the rest of the device. It’s a subtle improvement that leads to a better, more comfortable fit, as well as more accurate heart-rate tracking. Ionic also uses a red LED, as opposed to a green LED, to measure blood flow, which the company says also leads to more accurate readings. In practice, I found Ionic was better at measuring my heart rate throughout the day. With the company’s past trackers, I’ve experienced periods where the device would lose track of my heart rate. I experienced far fewer of those moments using Ionic. Another major improvement is waterproofing and swim-tracking. 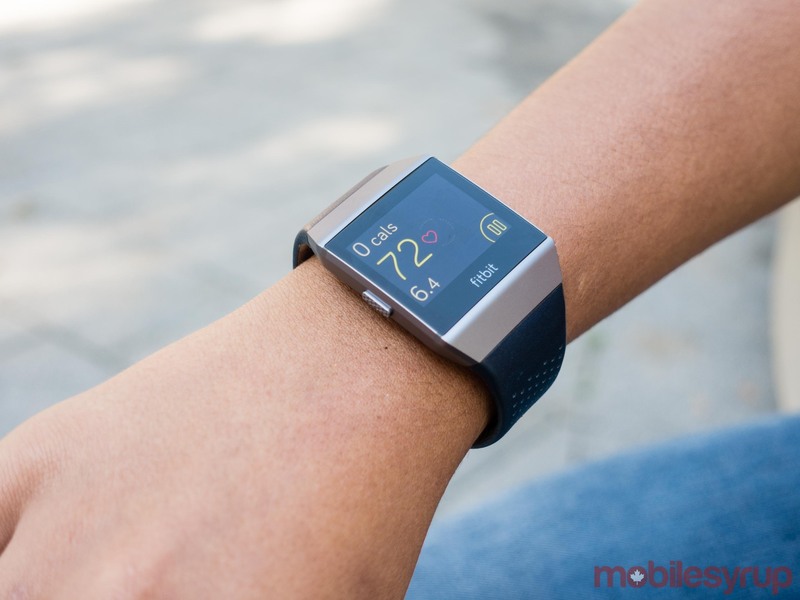 Prior to Ionic, Fitbit only offered those features in the low-cost Flex 2. The Fitbit faithful finally have a high-end offering that includes swim-tracking. Ionic is water-resistant up to a depth of 50 metres. I’m not a swimmer, so I didn’t test out its swim-tracking capabilities. That said, you don’t need to be a swimmer to appreciate the advantages of a waterproof smartwatch. I was able to take a dip in Lake Ontario near Ward’s Island without first taking off the watch. For those that want to take their tracker into the shower, that too is now a possibility. Lastly, not only does Ionic support standalone GPS tracking, it pulls positioning information from both GPS and GlONASS satellites, allowing it to better track users in especially dense urban environments. The star of the show, however, is Ionic’s display. In a word, it’s beautiful. Colours on the 1.5-inch display are vibrant without being oversaturated. With a maximum brightness of 1,000 nits — making it just as bright as the one that’s found on the Apple Watch Series 3 — text and icons are sharp and easy to read, even in harsh sunlight. Another of the display’s strong points is that it’s legible even while wearing sunglasses with polarized lenses. Finally, in a rare addition for Fitbit, Ionic features an ambient light sensor (the majority of Fitbit trackers include just one brightness setting). The sensor does an excellent job of ensuring that the display is the perfect brightness no matter the situation. It’s possible to manually adjust the brightness of Ionic’s display, but I never found it necessary to do so during my time with the wearable. Another great feature is Ionic’s battery life. Coming from an Android Wear or watchOS device, one might expect at best one full day of battery uptime. Ionic shatters those expectations, instead delivering at least four days of battery life in normal use and up to 10 hours when taking advantage of the device’s onboard GPS. Some weeks, I was able to get a full five days from my Ionic before I had to take it off to recharge the battery. What Ionic doesn’t do is fundamentally change the definition of what a Fitbit device is and can be. Certainly, there are features here that expand the functionality of the device beyond what past Fitbit products have been able to do, but whereas Ionic could have matched and surpassed devices like the Apple Watch, Fitbit’s first ‘true’ smartwatch just isn’t there yet. To start, Canadian consumers that buy Ionic will still need their smartphone to set it up and get the most out of it. Additionally, unlike the Apple Watch Series 3, the Ionic doesn’t feature LTE connectivity. In some instances, this severely limits the utility of some of the third-party apps that are currently available through the Fitbit App Gallery — Ionic’s app marketplace. To use the weather app, for instance, I needed to first sync my Ionic with my smartphone to get the Fitbit app to push the necessary data to make the weather app display forecast information. In the time it took the Fitbit app to sync that data to my Ionic, I was able to check the weather forecast on my smartphone and start reading a work email. With apps that are less dependent on frequent syncing, however, the experience is better. For instance, the Starbucks app, which allows users to store any gift cards they buy or receive from the coffee chain, just works. Then there’s the absence of third-party apps. At launch, there are only two third-party apps available to download from the Fitbit App Gallery. As a result, Ionic offers little to those who want something more than just a fitness tracker. Fitbit says Ionic will become dramatically more capable as time goes on, but it’s hard to see that happening for several reasons. Prior to launching its new app SDK, Fitbit announced approximately 1,000 developers had signed up to check out the platform on its first day of availability. One thousand developers is a modest number by any measure. It also doesn’t seem like Fitbit expects a lot of apps to make their way to the App Gallery; at the moment, the company organizes all the available apps in alphabetical order. Since launch, I’ve yet to see any independent developers push a custom watchface or app to the App Gallery. On the subject of software, another disappointment is that Fitbit acquired the software talent and intellectual property that made up Pebble, but then seemingly did little with any of the startup’s best ideas. This is most apparent in how Ionic treats notifications. It doesn’t adopt and expand upon the smart timeline functionality Pebble first introduced with the Pebble Time. Instead, notifications are simply displayed in chronological order. Worse yet, while Ionic can mirror notifications from both iOS and Android smartphones — and users have the option to decide which apps mirror their notifications — the only way to interact with a notification is to dismiss it. Without any meaningful way to interact with the notifications that were pushed to my Ionic, I disabled the smartwatch’s notification functionality. Thankfully, Fitbit did teach Ionic some new tricks. Thanks to the addition of two first-of-their-kind features for a Fitbit wearable, there are some scenarios in which Ionic users will be able to leave home without their smartphone. 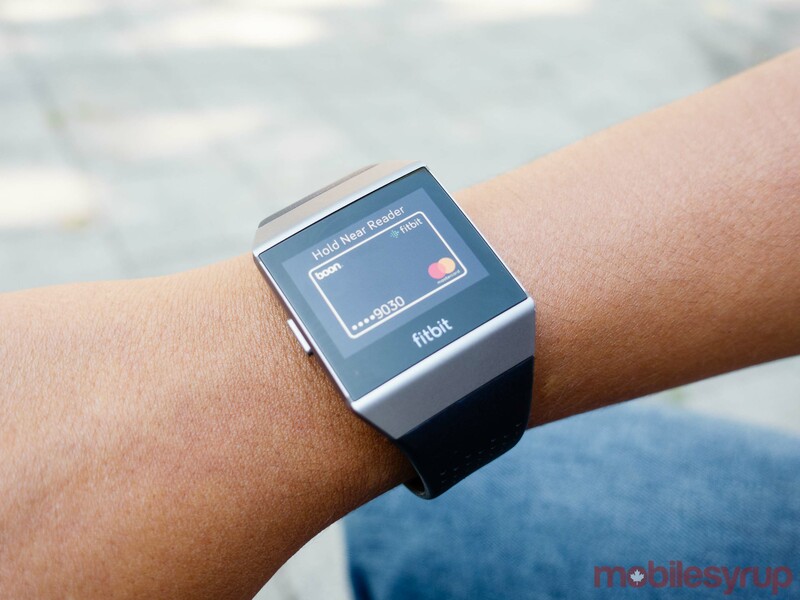 The first of those is Fitbit Pay, the company’s new mobile payments platform. I was able to test this feature thanks to fact that Fitbit provided me with a MasterCard gift card. Overall, Fitbit Pay works well. 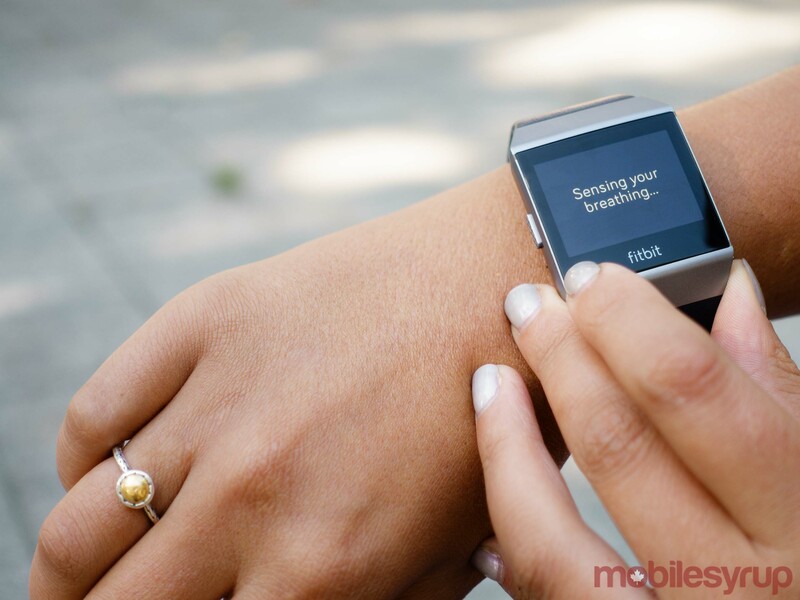 Adding a credit card is done through the Fitbit mobile app, a process that’s simple enough. Once you’re near a NFC terminal, you simply hold the single button on Ionic’s left side to authorize a purchase. Unfortunately, due to limited support from Canada’s major banks, the majority of Canadian consumers won’t be able to take advantage of Fitbit Pay. Later this month, Fitbit Pay will start to support RBC credit cards. Sometime in 2018, Capital One credit cards will also work with Fitbit Pay. Still, with just how much time it’s taken Apple, Google and Samsung to bring their respective mobile payment platforms to Canada, it’s easy to be pessimistic about the prospects of Fitbit Pay gaining widespread support anytime soon. The second feature that’s designed to help Ionic users leave their smartphones at home is dedicated music storage. Ionic includes 2.5GB of internal storage solely dedicated to storing music. The process of transferring music can feel antiquated at times. It’s not possible to transfer music directly from a smartphone. 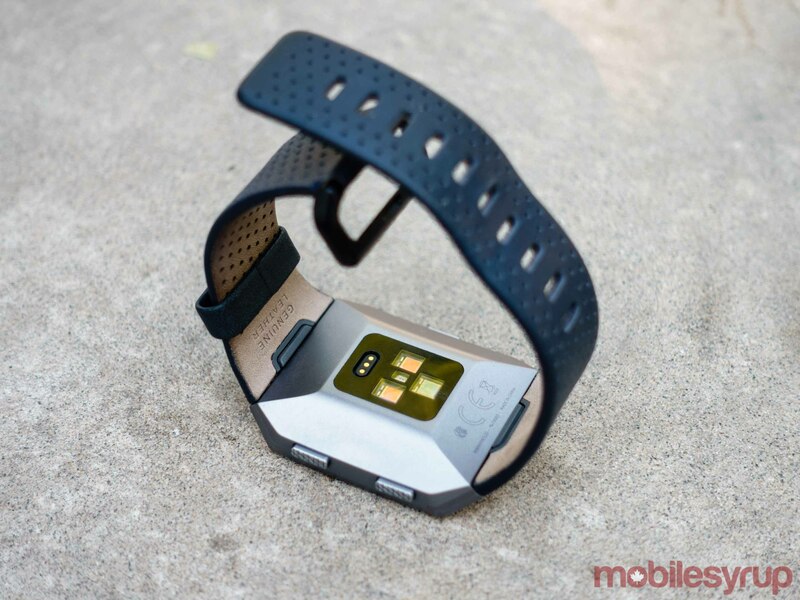 Instead, users need to install the Fitbit app on either their Windows or Mac PC. There’s also no support for streaming apps, at least not in Canada. In the U.S., Ionic ships with Pandora. 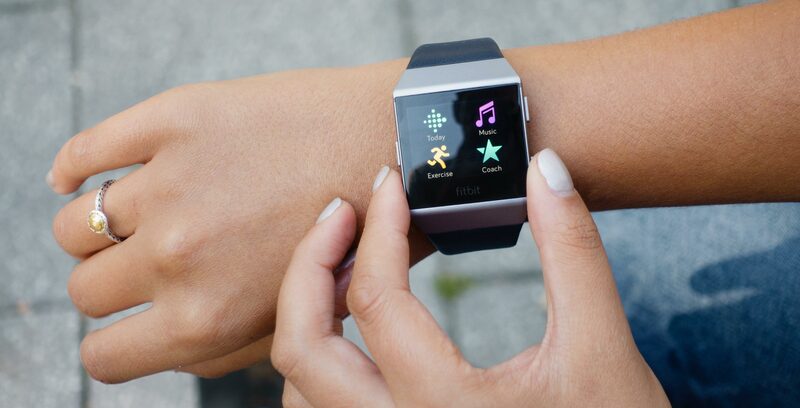 Fitbit says it’s in the process of securing international streaming partners. However, it has yet to announce anything definitive on that front. Once I was able to take advantage of those features, Ionic did feel liberating in a way that the company’s previous trackers have not. During one weekend run, I was able to listen to music and buy a smoothie after my workout, all while leaving both my smartphone and wallet at home. Elsewhere, Ionic represents a refinement of the fitness tracking capabilities that Fitbit has shipped with its past devices. The company says it’s constantly improving both the manual and automatic activity tracking functionality it ships with its trackers. For what it’s worth, I didn’t notice a major improvement. There are still notable holes in Ionic’s automatic tracking capabilities. 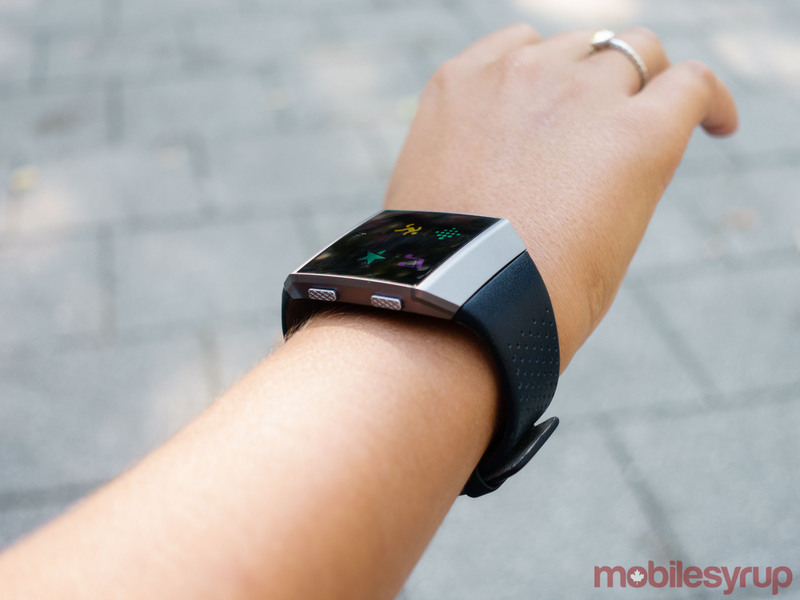 For example, the watch lists weightlifting as one of the activities it can track, but as with past Fitbit trackers, all Ionic does while the user does weight training is track calorie burn and heart rate. 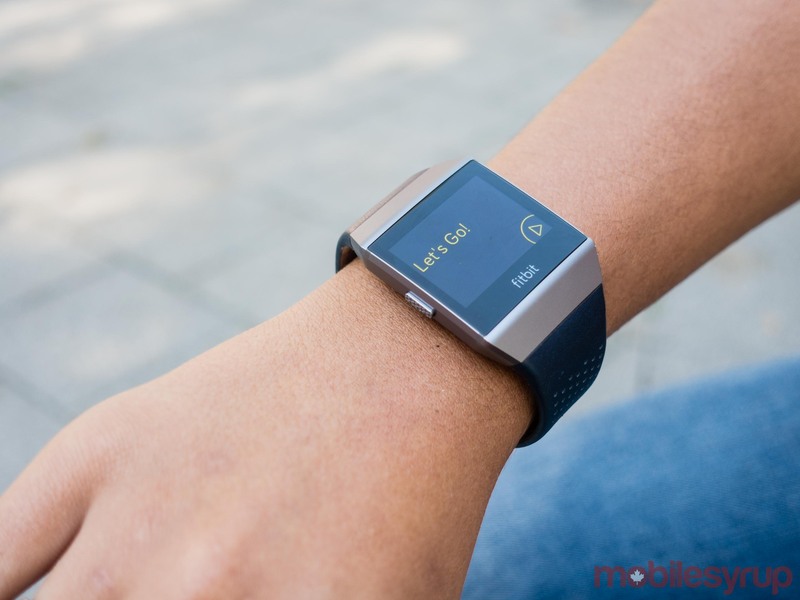 It can’t, like the Garmin Vivosmart 3, automatically track reps, nor does Fitbit provide an interface for users to manually log that information. Overall, however, the day-to-day experience of using a Fitbit device has never been better than with Ionic, thanks to its new interface. It’s hard to overstate what an improvement Ionic’s interface is compared to the tap interface that’s found on the Charge 2 and Alta HR. In my experience with those trackers, I found that, at best, the tap interface only ever worked sometimes (even after a reader pointed out to me that the trick was to tap the bottom of both devices’ displays). By contrast, minus some interface lag, Ionic’s interface was always responsive and easy to navigate — no tricks required. I didn’t have a chance to try all of the different bands that are currently available alongside Ionic. The two bands I did get to try, however, were a mixed bag. The included ‘Classic’ band, priced at $39.95 separately, I didn’t find particularly comfortable. The one positive is that Ionic ships with both a ‘small’ band that fits wrists between 140mm and 170mm in circumference, and a ‘large’ band that fits wrists between 170mm and 206mm in circumference. Fitbit also provided me with Ionic’s leather band, priced at $79.95 in Canada and available in two different colours — ‘Cognac’ and ‘Midnight Blue.’ The leather band was both more attractive and comfortable than the classic band. Also available is a ‘Sport’ band that features a perforated design with a more secure double buckle. In Canada, the sport band — priced at $39.95 — is available in two colour options. I’ve spent the entirety of this review without mentioning the price of Fitbit’s first smartwatch. In Canada, Ionic is $399.95 without any additionals bands or accessories. 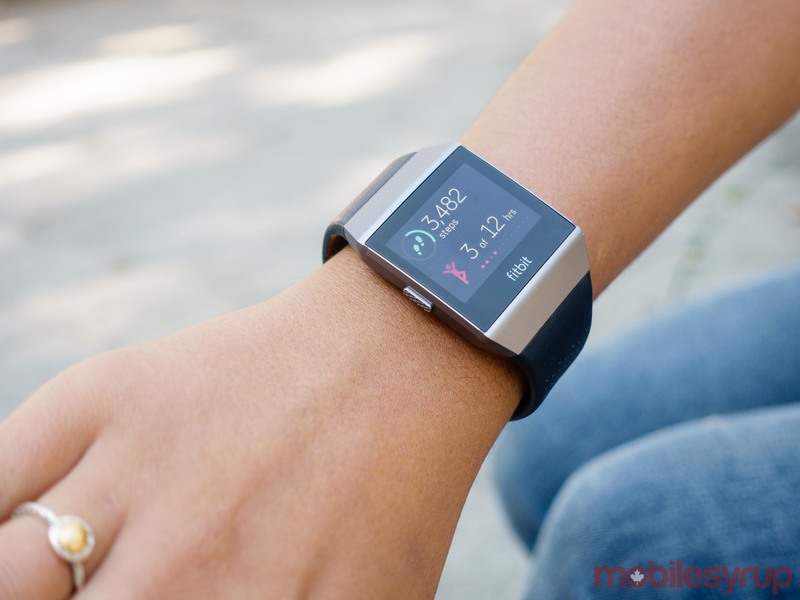 Without a doubt, Ionic is a better fitness tracker than Charge 2, currently Fitbit's most popular fitness tracker, but in its current iteration, it’s not a $200 better tracker, even with the addition of standalone GPS, Fitbit Pay and dedicated music storage. Ionic does show a lot of promise, but as I've said of similar products in the past, it's best to wait and see if that potential materializes into something substantial. "Without a doubt, Ionic is a better fitness tracker than Charge 2, but in its current iteration, it’s not a $200 better tracker..."